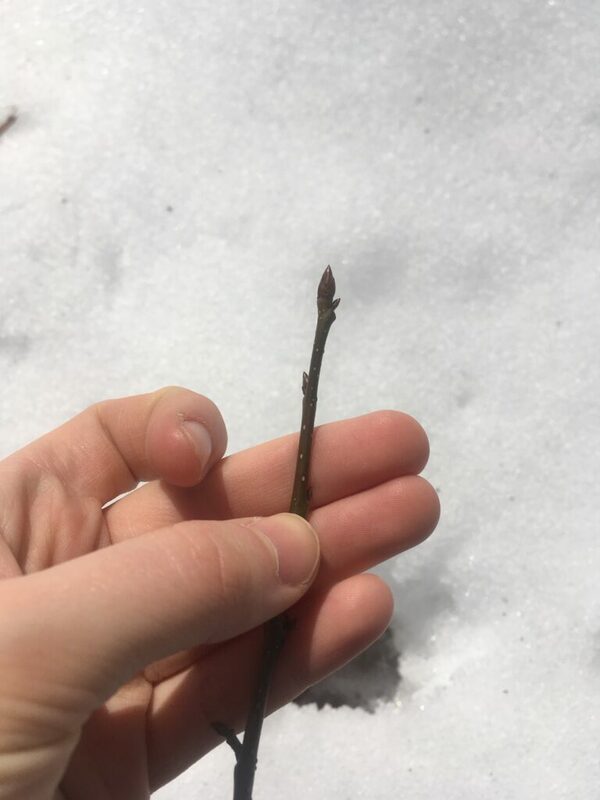 While home for spring break I spent some time at a local county park/reservation observing a familiar home natural community similarly to how I examine my site in Centennial Woods at UVM. 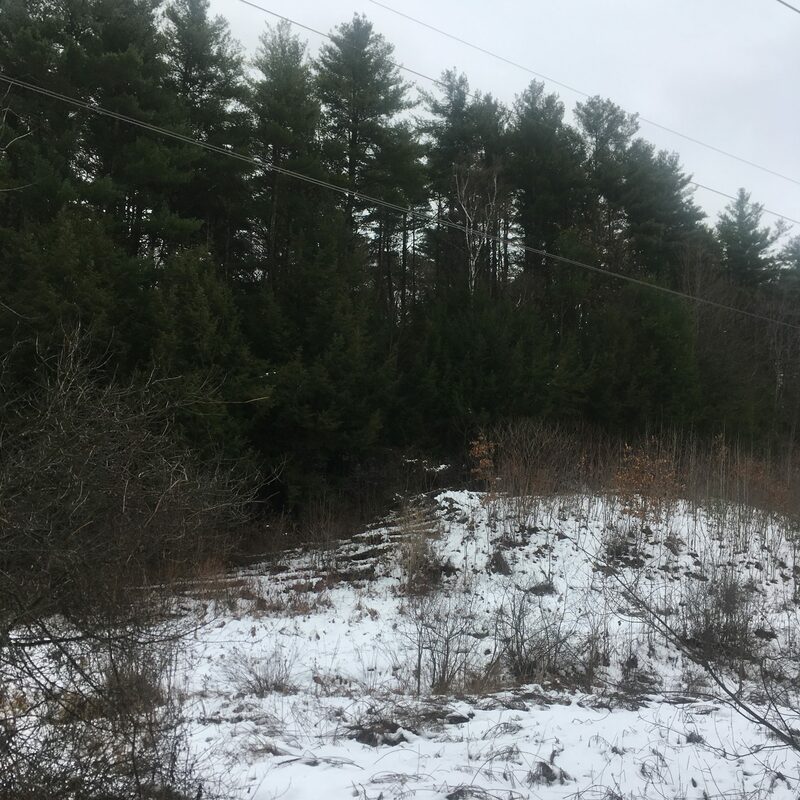 As can be seen above, this area of the reservation, which is a 157 acre area of protected wooded land, still had a decent layer of snow and a variety of tree species. 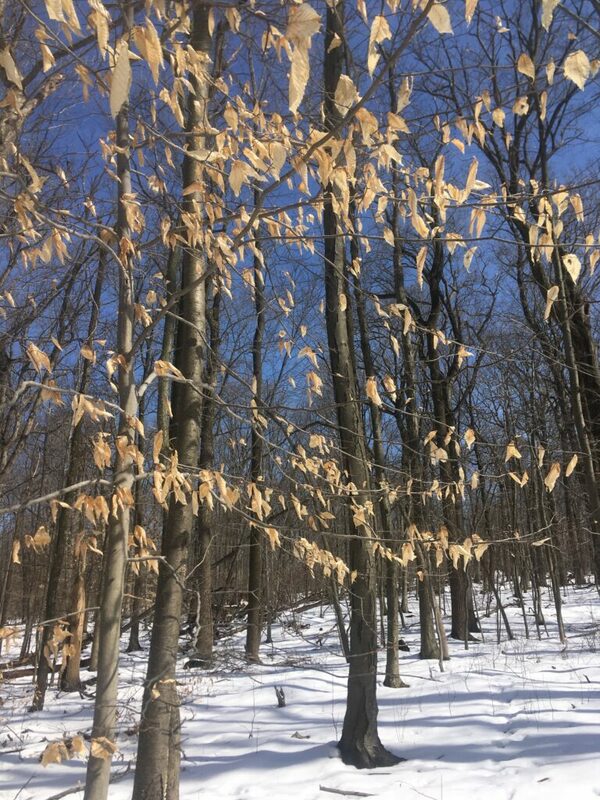 Some dominant species I observed were American Beech (which can be seen in the photo with all of its leaves intact, one of the few deciduous species which retains its leaves through the cold winter months), and Red Oak (which can be seen as the twig to the right). Overall this tree species composition was pretty different to my site in Burlington. There were no conifers present at all, and seemed to be much higher rates of oaks with very few maples. In terms of tracking, the only tracks I was able to find besides humans and lots of dogs were many deer hoof prints (pictured below). I found it surprising that even in the impressionable snow I didn’t see any smaller tracks, no mice or squirrels. 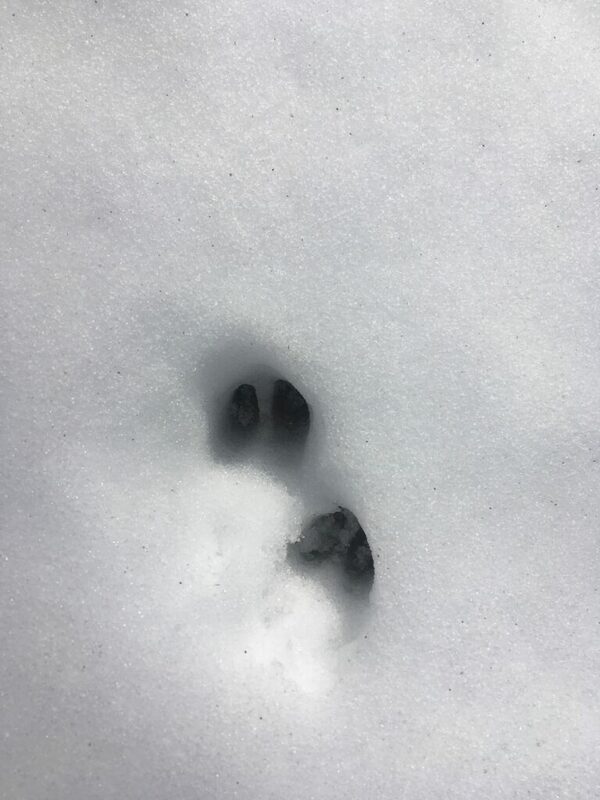 I’ve never had a winter trip to Centennial without seeing any small animal tracks. I think this may be a sign that the higher levels of human impact and development in New Jersey mean lower biodiversity and animal population health. Though the deer prints may seem like a good sign, this concerns me too as we have an overpopulation of deer in the suburbs around my town since so many are being pushed out of forested land and learning to live in towns, often taking refuge in the few wooded areas like Mills Reservation- hence the high deer traffic in these woods. From my research I discovered that Mills Reservation is also rich in human history. The park includes a large cliff side that gives beautiful views of the New York City skyline, making it a notable spot. Apparently the cliff edge may have been used as a fire-beacon station for George Washington during the Revolutionary War, who was perhaps unknowingly passing on tradition as native peoples likely used it for smoke signaling as well. Additionally this high visibility cliff was used during World War II as a center for searchlights and anti-aircraft guns. Today the area is simply a well-used recreational space that shows no signs of its past, so it was interesting to learn some of these stories. 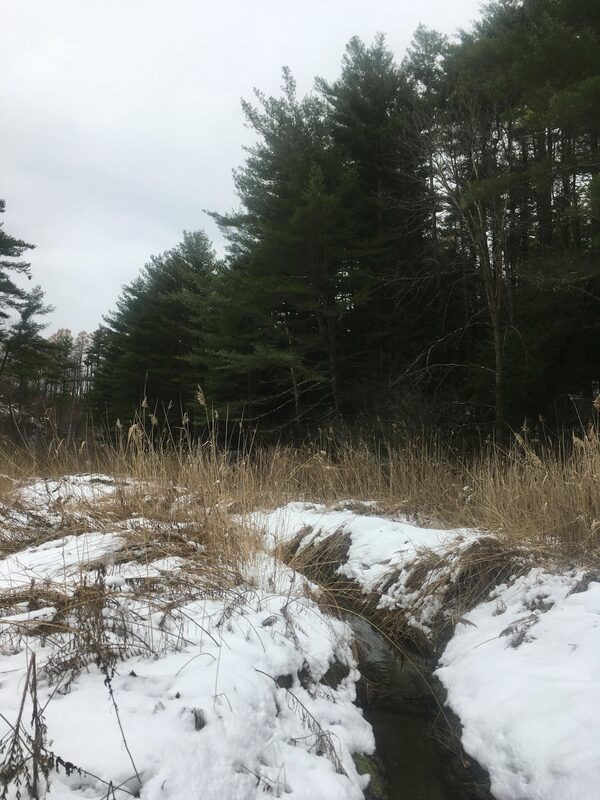 This trip to my site my mission was to identify what type of natural community the area would represent based on the guidelines set by wetland, woodland, wildland, a guide that lays out all the natural communities present in Vermont. I think my particular site is a tricky example since it is so heavily disturbed. Powerlines run right through the site, which means that all the new growth that pops up is cut down every four years. 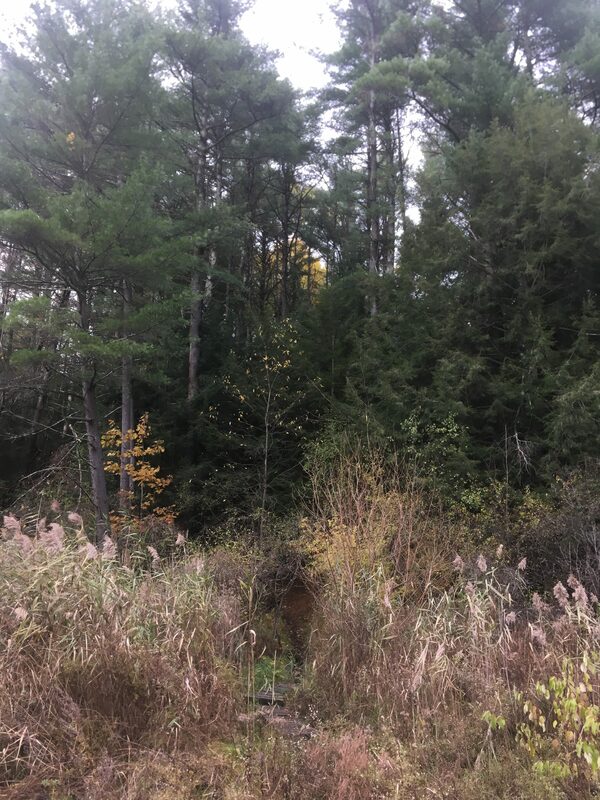 But, through considering the forest edges surrounding the site and identifying the saplings that have sprouted around the site I believe it would be classified as Hemlock-Northern Hardwood Forest if left undisturbed and allowed to go through all the stages of forest succession. With current conditions, however, the site is actually pretty beautiful, especially as precipitation and temperatures increase to begin to create some snowmelt. 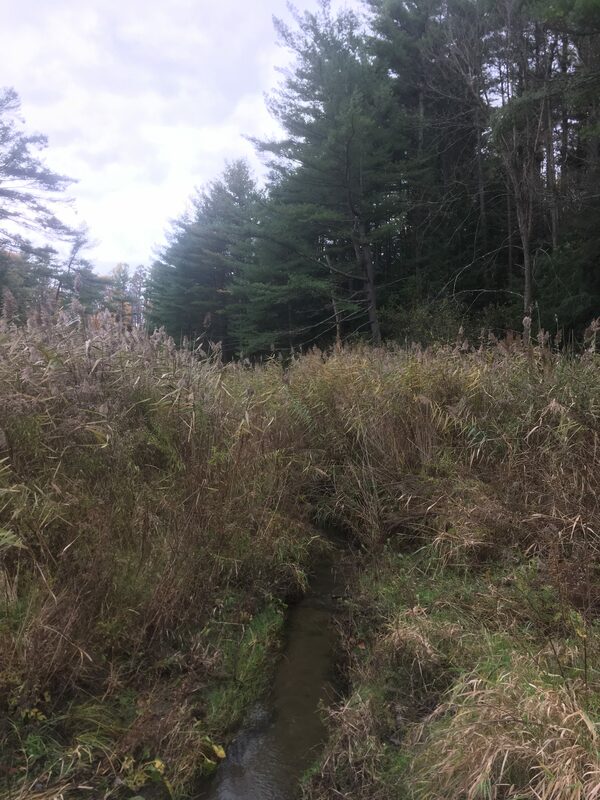 Because of the human disturbance my site is one section of a huge strip of land that is completely cleared, and has turned into a combination of wetland, meadow, and early succession forest. Tree species that enjoy a lot of sun, such as sumac, move in and prosper, and the brook introduces all sorts of aquatic life. My site has changed immensely since I first started visiting it last fall. I’ve seen it become completely blanketed in snow for months, and now I’m beginning to see it come back to life. Something I found particularly interesting this visit was that as the brook begins to melt layers have begun to form which look almost like strata layers in rock (left). 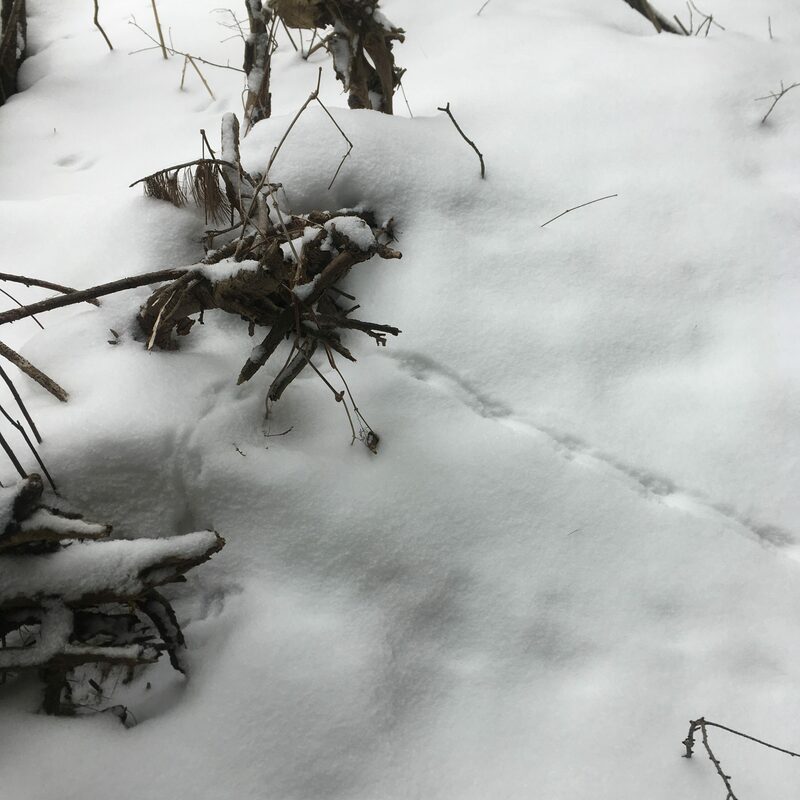 I also saw some very fresh deer tracks on the path by the brook. 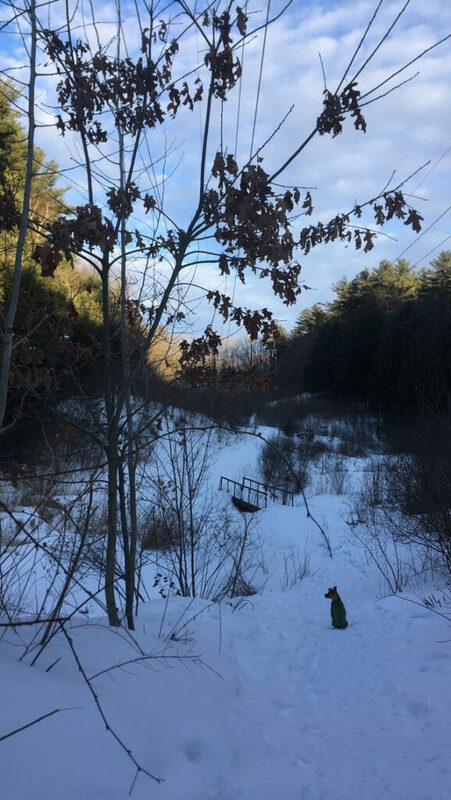 I’m back in Vermont for a second semester and revisiting my phenology site after a long absence. Winding around the trail’s bend today I didn’t expect the site to look much different than it did in December, but I quickly learned I was wrong. Where there was once running water there is now just a slightly lower layer of thick snow. Without the bridge the brook would be practically unidentifiable. There is also even less plant life than I had last seen. The contrast between the forest edge and my site’s clearing is starker than ever. Looking for signs of wildlife was tricky. Fresh snow has been falling all morning, covering up whatever evidence was already there. However, I did follow a few tracks I was able to find. 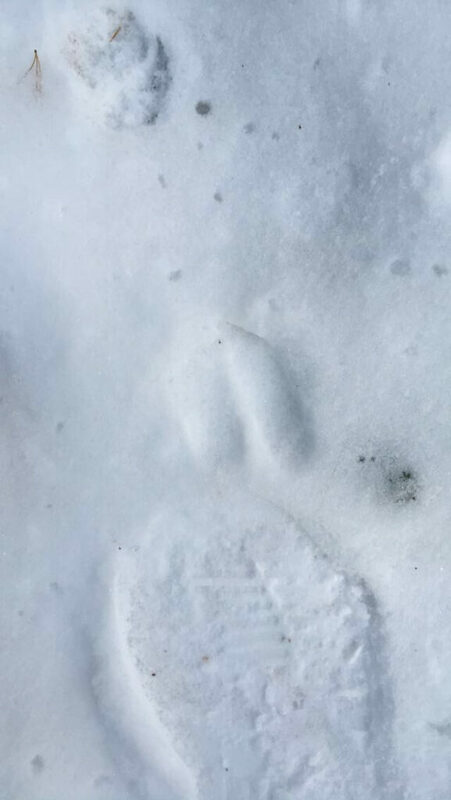 The first, pictured above, I believe was a cottontail rabbit because the stride was quite long and the hind feet were very large in proportion to the front. 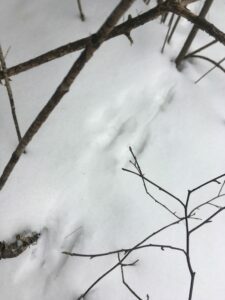 These tracks led into the underbrush where I couldn’t follow to see any destination. The second tracks were much smaller, and pretty faint. I think they belonged to a white-footed mouse since they’re also in a galloping pattern, and showed him scampering towards warmth beneath a log. 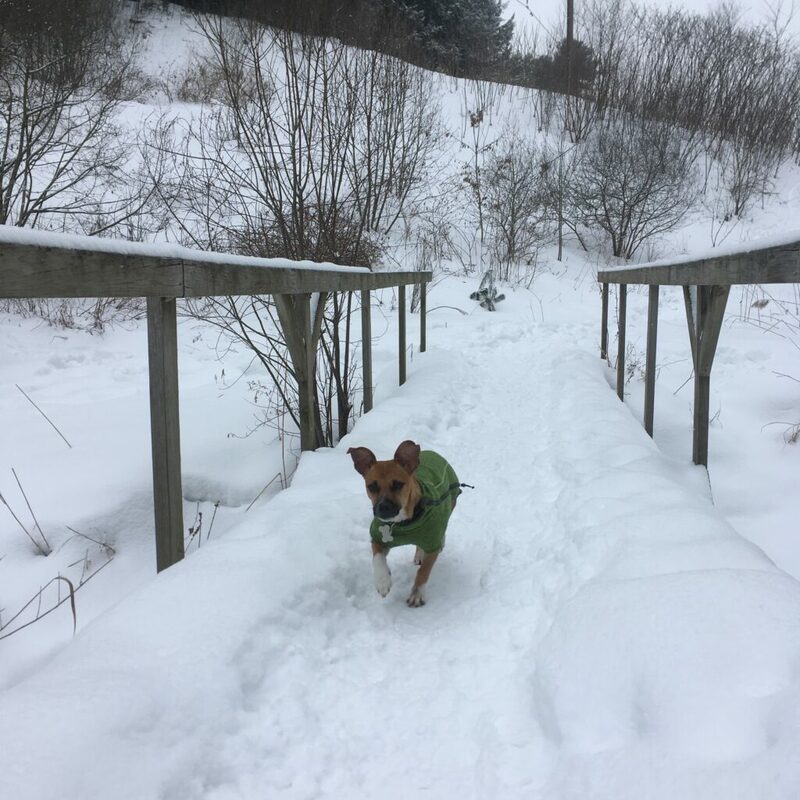 The last tracks that I saw a ton of (above) gave themselves away with their sporadic behavior and impractical energy use as unfortunately not a fox or coyote, but my little tracking companion Willow (below). 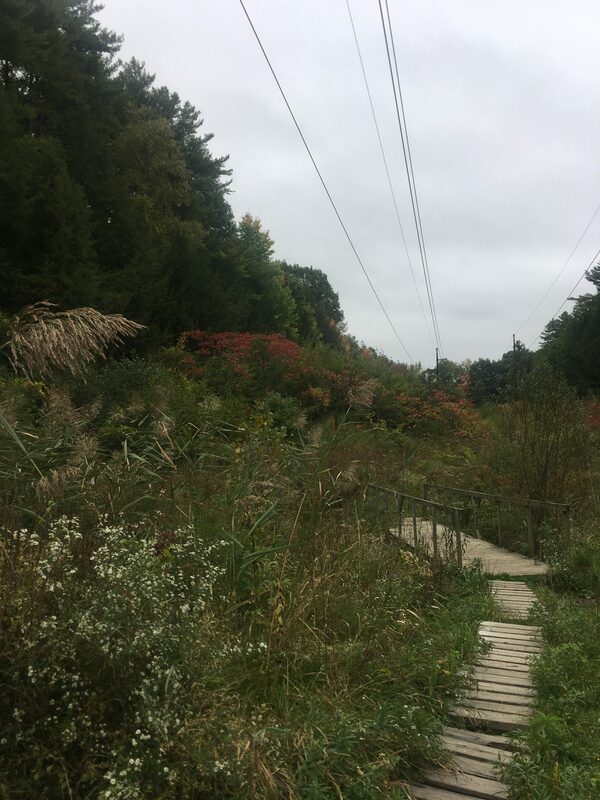 Identifying all of the deciduous trees on my site was a little difficult since many species within the clearing I’m not very familiar with, and then the forested section is mostly coniferous. The deciduous trees I could see and identify were white and red oak, striped maple and American beech. Above is a photo of some twig samples I took from some of the dominant species I saw in and around my site. 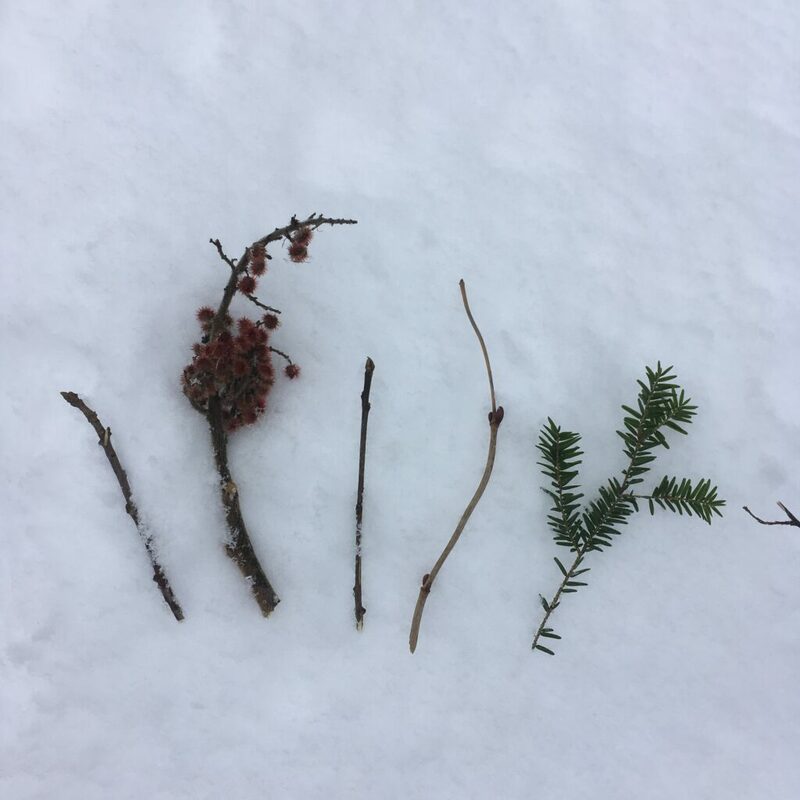 I tried my best to identify them there and at home, and from left to right I believe they are red oak (Quercus rubra), staghorn sumac (Rhus hirta), glossy buckthorn (Frangula alnus), American basswood (Tilia americana), and eastern hemlock (Tsuga canadensis). 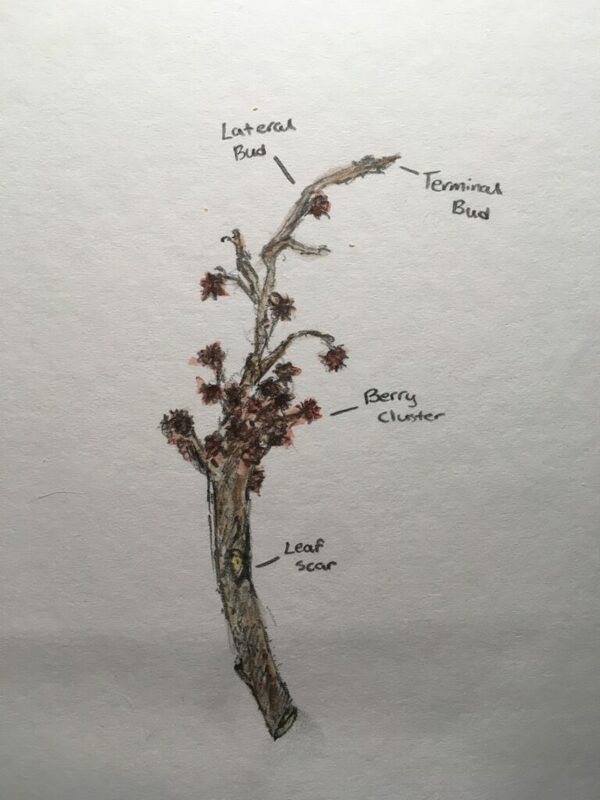 Below is a sketch I did of the staghorn sumac, definitely one of my favorite species in my phenology site. I visited Centennial Woods today to see it under snow for the first time. I was truly amazed at how different it looked. Most of the vegetation seemed to be gone, all buried under the heavy and icy snow. The water was the clearest I’ve ever seen it, and the entire forest was quiet and serene. 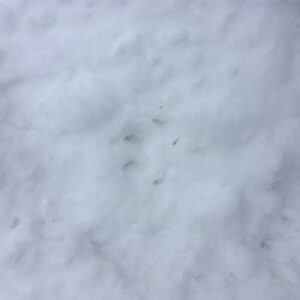 I was hoping to make some new discoveries about my site based off of animal tracks and other snowy evidence, however the snowfall was too old and had experienced too much foot traffic to pick out any interesting tracks. I did document one pop of color that stood out to me at the edge of my site (pictured below). 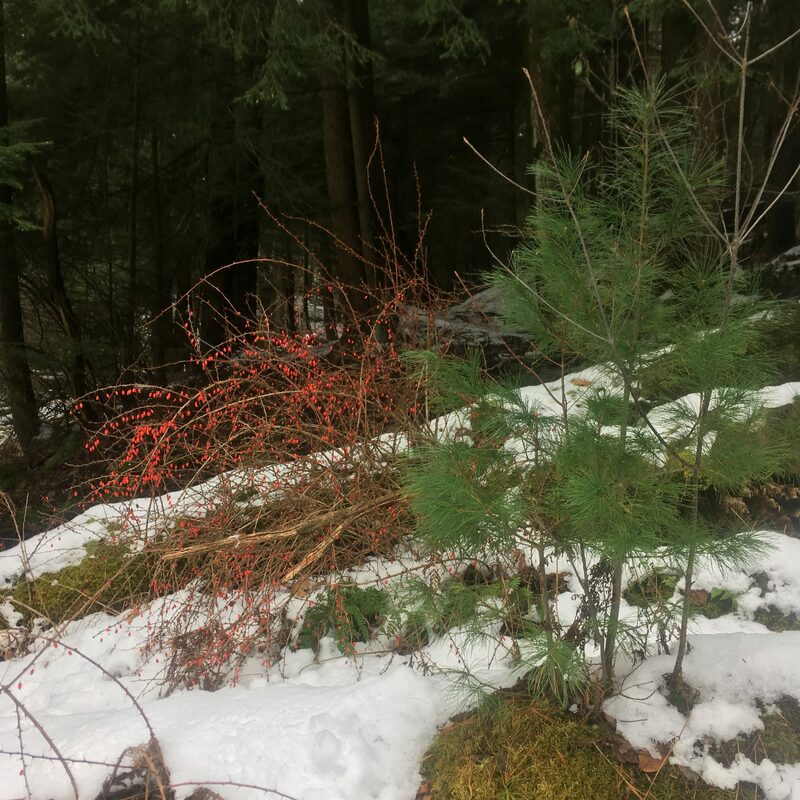 I believe this is a very young eastern white pine (Pinus strobus) next to a fruiting invasive barberry plant (Berberis vulgaris or possibly Berberis thunbergii). I also wanted to write a bit today about the human history on this land. 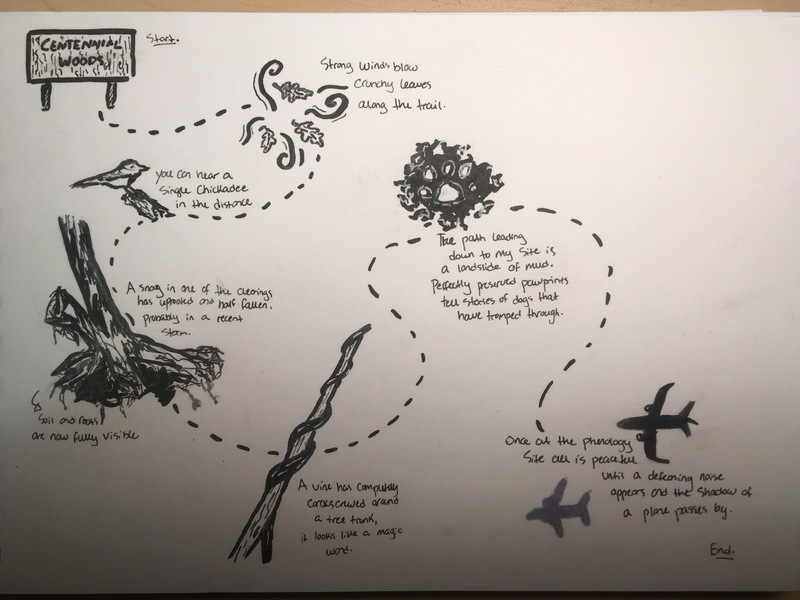 I chose my site in particular because it is so heavily impacted by humans, which I think creates a very interesting and unique ecosystem. Centennial Woods was purchased by the University of Vermont from various owners starting in the late 1800s. In 1968 they purchased the final piece of privately owned land and Centennial Woods as we now know it was formed. This means that the area hasn’t actually been protected for very long. Much of it was likely used for agricultural purposes in its past. 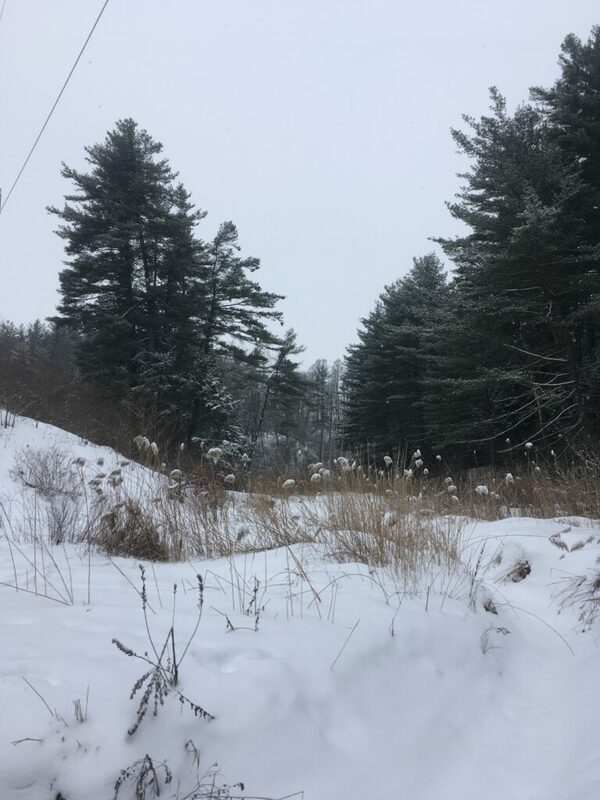 This means that Centennial is an example of the story of much of Vermont land, one of native Abenaki use, moving to European settlement and agriculture with intense deforestation, and then eventual reforestation. I find my little section particularly interesting because it still experiences much more human impact than the rest of the woods (which get their fare share from pedestrians as well). 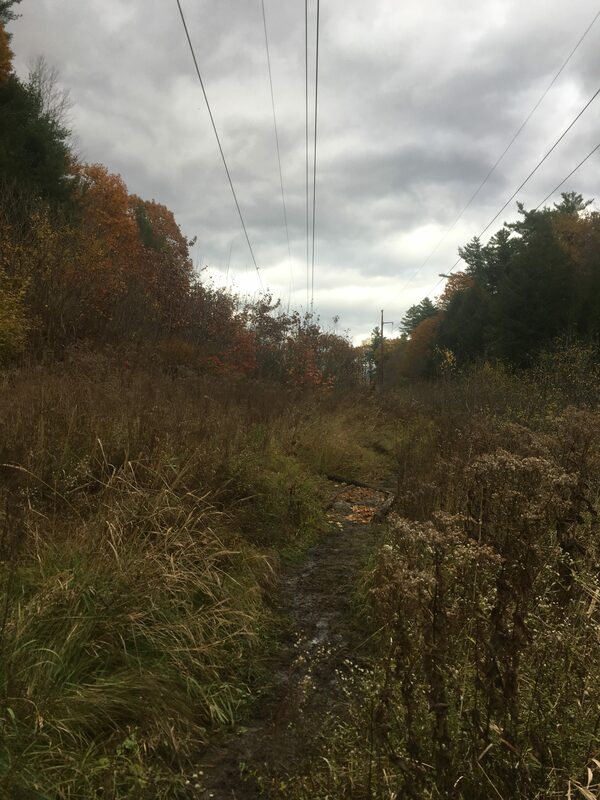 The area of my site is routinely cleared every few years so nothing will grow tall enough to impact the power lines. I’m including the photo below, which I took today, since you can see a row of logs along the side of the hill which leads down to the bridge. I’m not sure how old these logs are, but they’re a good visual of how much heavy impact this spot experiences. While home for Thanksgiving break this week I took my usual 5 minute trip up windy Eagle Rock Lane to Eagle Rock Reservation, 408 acres of forest nestled into dense suburban Northern NJ. 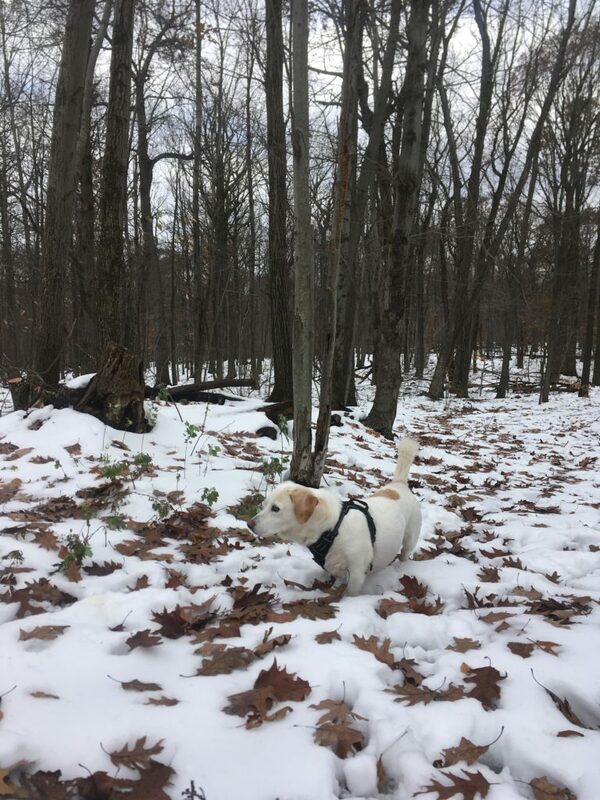 My dog Gatsby, featured in the photo above, knows this drive by heart and whines with excitement as soon as he can see the rise of trees approaching as we climb up steep roads. I caught Eagle Rock with its first layer of snow of the year. Two days old now, it’s become crunchy with an icy layer on top. Despite the blanket of white the forest is clearly awake. Squirrels not expecting the frost so soon are still rummaging about getting ready for winter, Gatsby keeps a close watchful eye on them. I didn’t see any deer, I know from experience that they like to wander through town during the day and retreat to wooded areas like this at night, but there were a few cloven hoof prints in the snow. Gatsby and I make our way towards our favorite trail which runs alongside a stream. The volume of the stream has doubled compared to usual, simply from snowmelt. 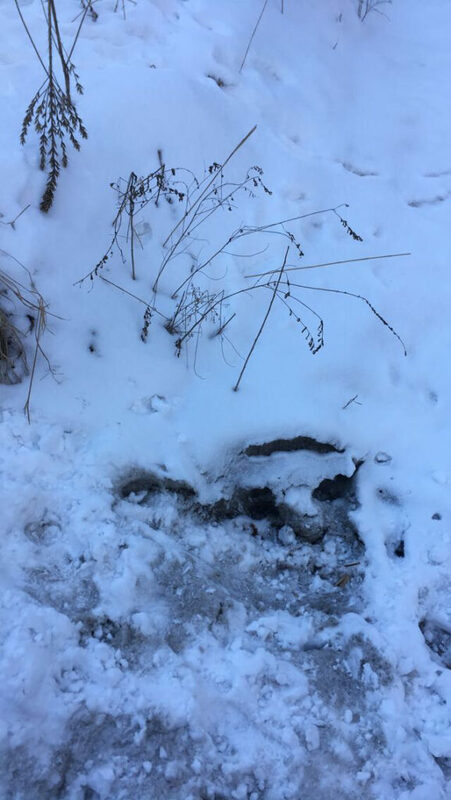 My dog who normally seizes any opportunity to jump in questionable water decides not to this time, he knows it’s too icy and deep. As we walk more, this gets me thinking about his relationship with this forest. I think that Gatsby with his powerful hound nose has a lot to teach me about the phenology of this place. I imagine that he can smell the paths of every creature in the forest, from bird and mouse to dog and person. Maybe he sees these lingering trails mapped out in his mind’s eye, the dynamic ever-changing story of this place, one I can only make guesses to understand. I chose this place specifically since Centennial Woods in Burlington has become my new version of Eagle Rock Reservation. They are both natural areas in highly populated areas. They have high foot traffic, and have been designated natural areas for quite some time (Eagle Rock in the 1800s, Centennial in the early 1900s). Interestingly, Eagle Rock was designed in part by the Olmsted brothers, who are famous for Central Park, but made their mark in Vermont as well by designing Shelburne Farms. Most importantly, these two places have become my go-to spots for momentarily retreating from development and into nature. The first thing I noticed while in Eagle Rock is that many of the leaves haven’t yet fallen, whereas in Vermont almost all of the hardwoods leaves are down (with the exception of young American Beech (Fagus grandifolia), who often keep their leaves through the winter). Below is a picture from Eagle Rock of a Norway Maple (Acer platanoides) that I thought was striking since it has kept almost all of its foliage, and most of it is still green. I’m assuming this difference is simply due to climate, as New Jersey has stayed much warmer than Vermont, even if it did experience some early snow as well. Walking through both of these places it’s clear how important they are to their communities. 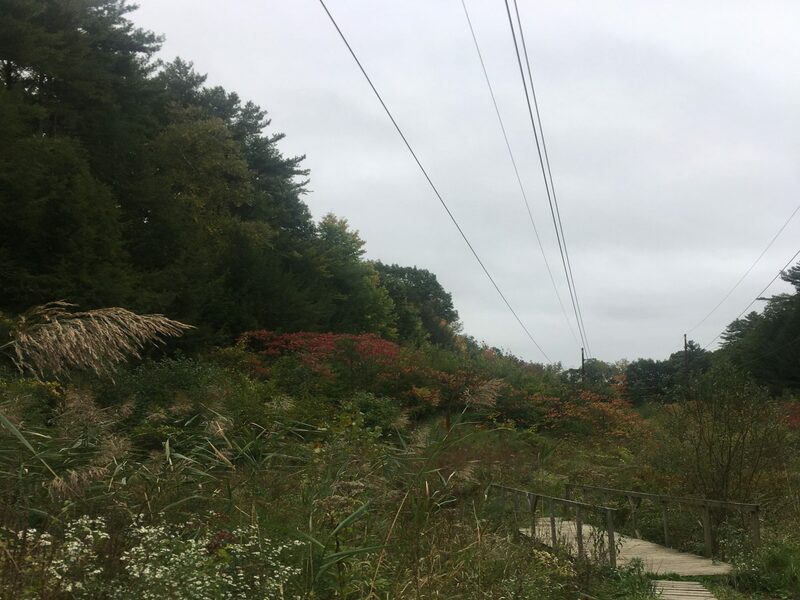 Perhaps Centennial Woods and Eagle Rock Reservation don’t provide the most breathtaking views or challenging climbs, but they are clearly well loved and needed, bringing an essential dose of forest to more populated areas. I believe places like these are even more likely to become home to special memories, since really it’s the everyday things that make the biggest difference. It’s a new season in Centennial Woods and once again rapid changes are occurring. During today’s visit to Centennial I drew out an event map of some striking features in the landscape as I made my way towards the site. 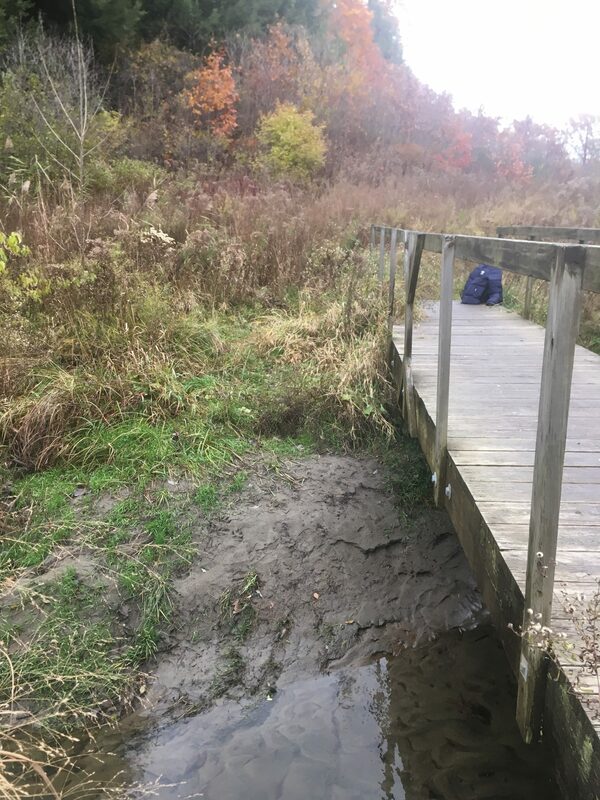 The site at Centennial Brook has transformed recently due to a combination of seasonal changes- temperature drop, etc., and the huge amount of rain the area has gotten over the past few weeks. At the edge of my site further into the forest things look fairly unchanged since it is so evergreen dominant, but in general there is much more leaf cover and decomposition occurring everywhere around the site. I did spot two small fish swimming in the brook today, which was a first! I’ve never gotten to see any life in the brook before although I check thoroughly with each visit. Next are some more pictures capturing the current state of the site and an original poem reflecting on the changes. Someone has come in the night and turned down the saturation. Leaving the landscape monotonous brown. The grasses are dried out, crunchy stiff. When the breeze comes dry leaf against dry leaf makes a kind of haunting wind chime. For the ground has sucked the life out of the plants, perhaps out of envy and a want to also feel the touch of the fresh air. But now she is simply waterlogged. Brook higher than before, muddy and murky. Two fish are spotted, heads pointing towards the lazy current. They too seem ready to tuck themselves in for sleep. 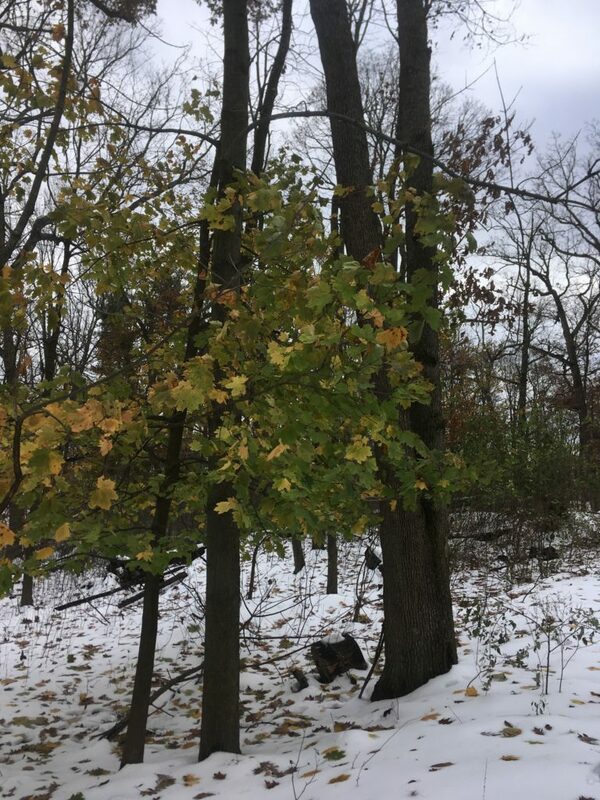 October is winding down, and today as I visited the phenology site we had our first snow, even though it was just a sprinkling. The site is changing quite a bit as the seasons having been transforming rapidly the past few weeks. 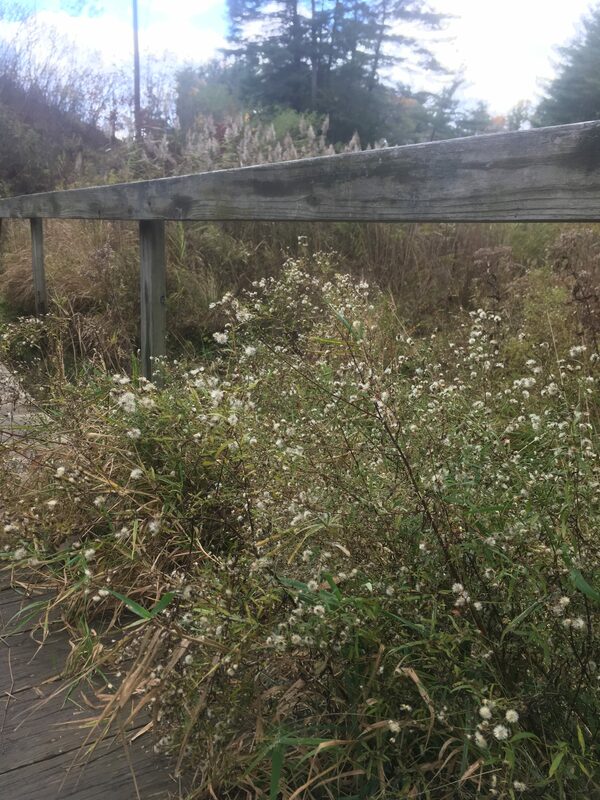 Leaves are down and creating a crunchy layer, and the meadow is looking less and less colorful and more monotonous and brown. On my visit today I saw a few squirrels running around frantically and lots of birds rustling the fallen leaves as they hop. It seems like the wildlife has sensed the changes and everyone is preparing for winter. Today I took a trip to my phenology site which is located in Centennial Woods Natural Area. To get there, enter the woods along Catamount Drive and following the main trail straight. The trail should lead you through wooded areas including over some platforms at muddier points. Once you get to the first clearing you will bear right, following the white arrow posted on a tree. 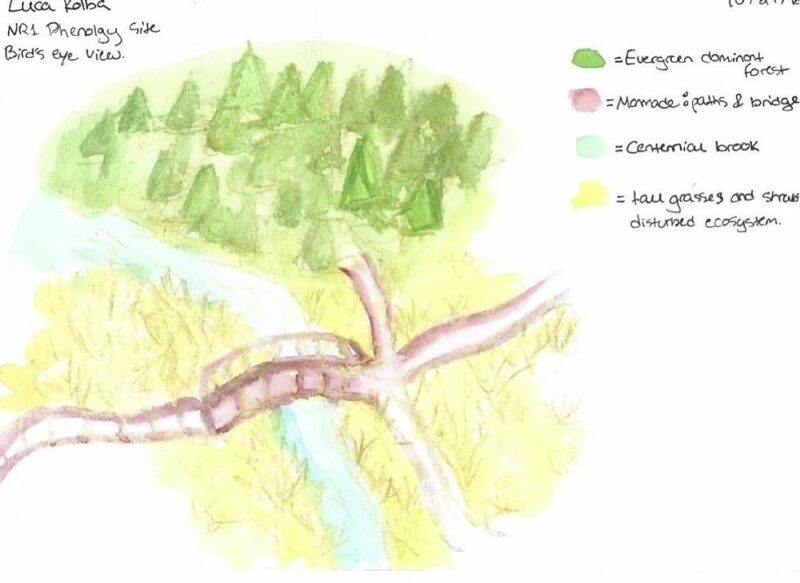 Here you will walk along boardwalk and past the brook until you get to a larger clearing with multiple trails branching off. 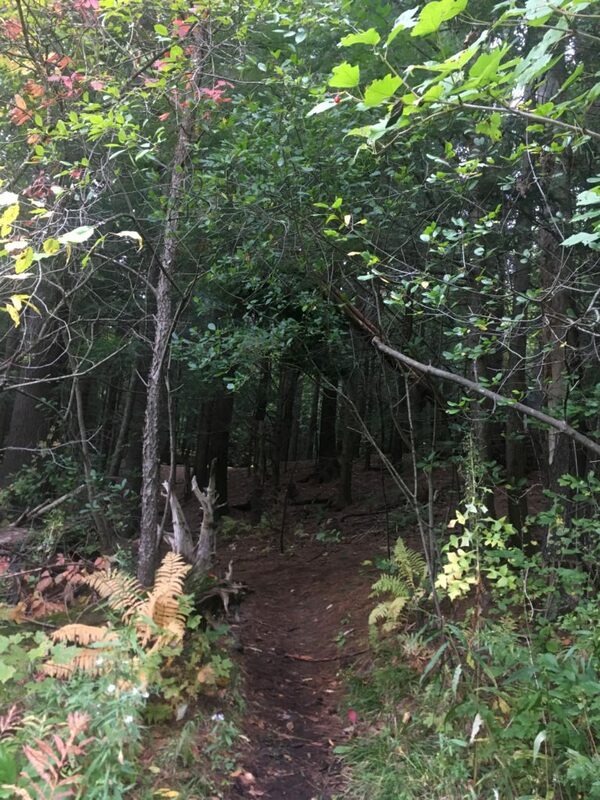 To get to my site take the trail straight ahead which continues into a mature hemlock stand. 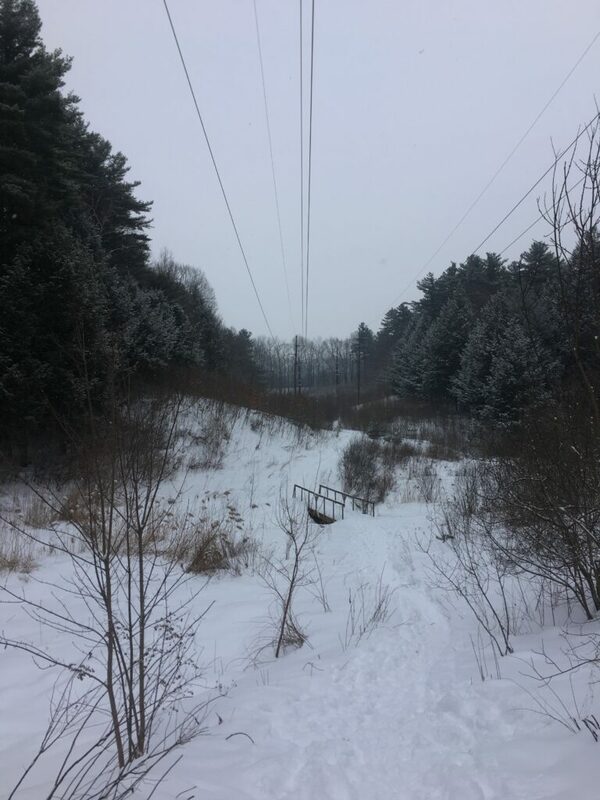 In a few minutes the hemlock stand abruptly ends as you reach an area that has been cleared for power lines. The trail will take a sharp right, and you will be able to see the bridge straight ahead. I would love to learn to identify the plants growing here. 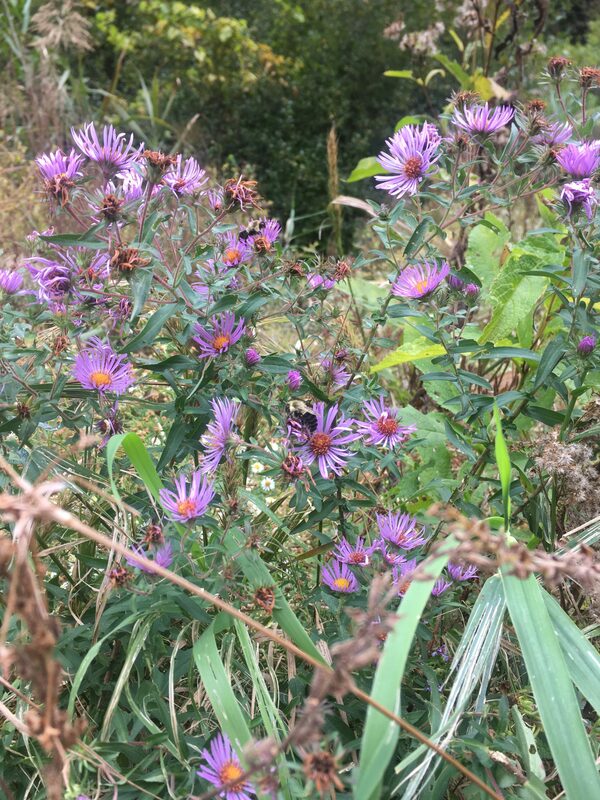 For now I was able to identify this New England aster, which had two slow moving bumblebees pollinating it. They are probably some of the last bumblebees to be pollinating before all but the queens die out for the winter. I am also included the edge of the surrounding forest in my phenology site. This forest almost completely evergreen, and dominated by old growth eastern white pines and eastern hemlocks. In fact, Centennial Woods is home to some of the oldest hemlock trees in the state. At the very edge of the woods I also spotted some younger striped maples and white oaks. Here is a view of the entrance to the evergreen forest from the meadow. I’m excited to revisit my phenology site and continue to explore it’s flora and fauna.